Being based in the borough, Tameside is a place I frequently photograph. Made up of a cluster of medium-sized towns – Ashton-under-Lyne, Dukinfield, Hyde, Stalybridge, Mossley, Denton, Droylsden and Mottram-in-Longdendale - it is a place of greatly varied fortunes and kinds of visual impact, from the Victorian redbrick terraced houses that line its streets, to vestiges of the industrial heritage that made the area, to the Pennines that create a dramatic backcloth from many locations, and now to the modern housing estates that pepper the hillsides. Having a keen specific interest in architectural photography, I very much enjoy shooting the huge industrial buildings, but modes of transport are as much a part of that heritage: first the canals, then the trainlines. One of my earliest surviving artworks is a painting created from a photographic montage of Stalybridge Station – see my painting website (see links). This shot is of Portland Basin in Ashton-under-Lyne. 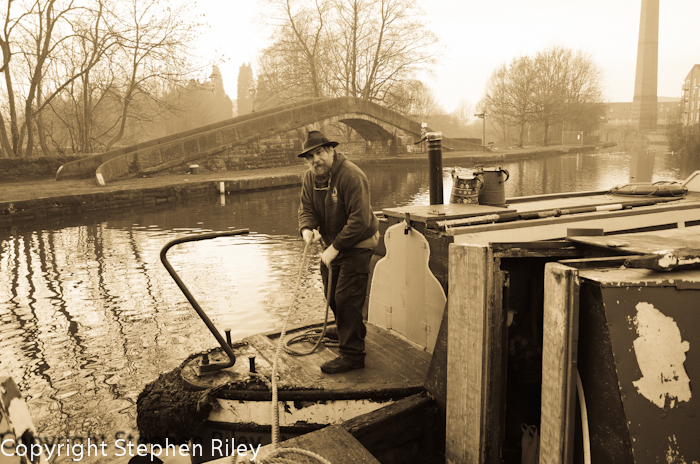 It shows Chris Leah – Secretary of the Wooden Canal Boat Society – taking to the water earlier this year. It is one of many shots I have taken of this sort.